I am going to make sure I have them on hand all summer long. YUM. Preheat oven to 180°C. Wash and trim beetroot. Wrap each one seperately in aluminium foil with a drizzle of EVOO and place into a baking tray. Roast until tender. Cool until you can touch them. Using the foil, rub the skins off and discard. 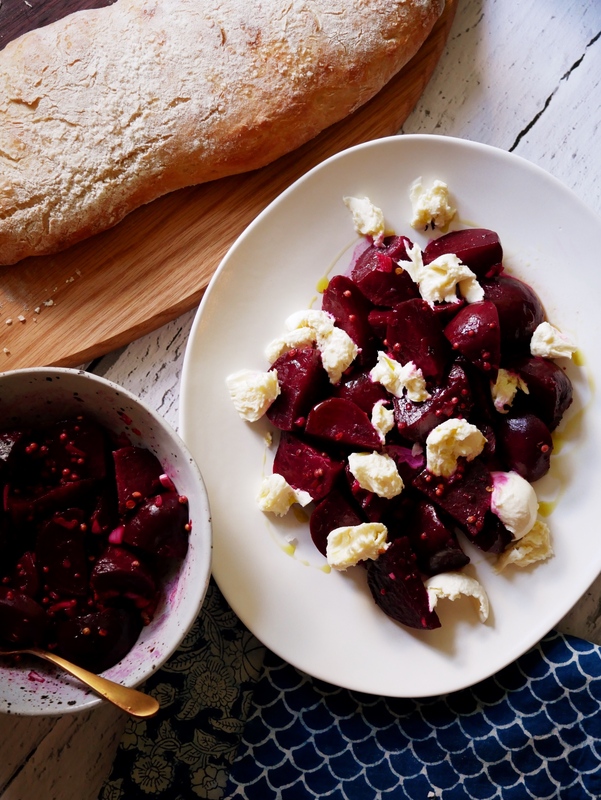 Quarter or cut each beetroot into wedges and place into a shallow dish. While the beetroot is roasting, dry toast the coriander seeds on a medium heat until fragrant and just smoking. Cool. Place all remaining ingredients into a bowl with the toasted coriander seeds and stir with a fork. Pour over the still warm beetroot. Allow to marinate for at least 1 hour. Serve on their own, or as shown, with fresh baguette, bocconcini and plenty of EVOO.